Following Tuesday's arrests of at least 300 suspected members of the 'Ndrangheta, the BBC's Duncan Kennedy in Rome takes a closer look at the Italian crime family. The wedding scene in The Godfather is a sumptuous affair, replete with hope, but laced with menace. Now, undercover police agents in Italy have infiltrated the real thing and revealed a fascinating insight into modern day organised crime. Weddings, baptisms and other events have been targeted by officers as part of an operation that climaxed this week with the arrest of more than 300 suspected mobsters. Their syndicate is not the "Mafia", as such, which is the name given to the Sicilian Cosa Nostra. It's the 'Ndrangheta, a gang that's less well known outside Italy, but which experts believe is now a much more powerful organisation. Details of the police undercover operation have just been released. For more than two years they've carried out surveillance on the 'Ndrangheta. It included agents attending one wedding last year of the children of two crime bosses from the 'Ndrangheta. Along with the thousands of well wishers at the event, was Domenico Oppedisano. 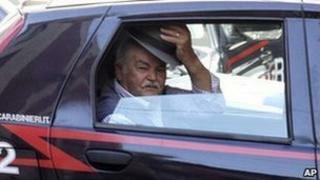 Police say he was there not only for the wedding, but to be named as the new head of the 'Ndrangheta. Two weeks later, the undercover agents got video of Mr Oppedisano being formally appointed as leader and other senior crime syndicate bosses being elevated to their new positions. Mr Oppedisano was among those arrested in this week's raids. Investigators say that since August of last year, they've been able to record all the major negotiations of the various families that make up the 'Ndrangheta. They say that includes around 40 meetings in Lombardy in northern Italy, an area which has become a major focus for the 'Ndrangheta, far from its base in Calabria, in the "foot" of southern Italy. It is now believed that as many as 500 members of the 'Ndrangheta operate in Lombardy alone, with Milan at its heart. One hundred and sixty alleged members of the gang were picked up in Lombardy as part of the police raids. That significant move into northern Italy is just one of developments to emerge as a result of this operation. Another is that police didn't realise how well organised the 'Ndrangheta is. They say it has a tight hierarchical structure and is not just an association of clans, as previously thought. That became clear, they say, when the Lombardy branch tried to exert some autonomy from its southern base. Police say Calabrian bosses sent a professional killer to murder the would-be upstarts. Police haven't made clear if that actually happened. The 'Ndrangheta emerged in the mid-1970s, though its origins can be traced back to the 19th Century, when it appeared to surface in the aftermath of Italian unification. It fought a series of bloody internal feuds which left hundreds dead. Now it appears much more cohesive. As well as operating across Europe, it has links with the Colombian drug cartels. In 2006, Italy's anti-Mafia prosecutor announced the discovery of a submarine in Colombia, which was apparently being constructed on behalf of the 'Ndrangheta for smuggling cocaine. Italian magistrates have estimated its annual income at more than 35 billion euros. That's more than Fiat. This week's operation against it won't finish off the 'Ndrangheta. It's too wily and entrenched for that. But we've now been given a better glimpse into how it works - and into what the authorities are doing to control an organisation that really has come out from the shadow of its more famous Sicilian neighbours.